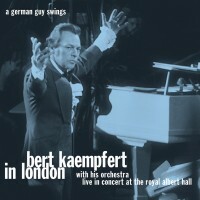 On April 22, 1974, Bert Kaempfert went on stage with his great Orchestra for the first time in the venerable Royal Albert Hall in London, and gave two live concerts on the same day. Following a spectacular introduction, he greeted the audience with a simple “Good evening”. With his reserved, charming manner and his slightly faltering commentaries in English with American accent he won the hearts of the audience, who nevertheless immediately saw that Bert Kaempfert was a musician through and through. After just a few bars, he managed to fill the normally cool English audience with enthusiasm in both performances. The 7,000 people at each concert were enraptured, even in the boxes occupied by the aristocracy and prominent figures, where the ladies and gentleman normally only used to clap discreetly, there was lively applause that evening. Both performances were an unprecedented success. Shortly afterwards, Polydor released the LP LIVE IN LONDON, including 12 songs from the concert. Due to other productions with Bert Kaempfert and his Orchestra in the years that followed, the second LP LIVE IN LONDON VOL. 2 that was planned at the time was subsequently forgotten. The complete recording of the concert lay unedited in the archive of tapes. On the occasion of Bert Kaempfert’s eightieth birthday, this legendary concert will be released in its entire length on this double CD by Polydor. The sound engineer Peter Klemt went back to the sound mixer for the extensive editing of the tapes, since no-one knows the typical Kaempfert sound as well as the man who, together with Kaempfert himself, mixed down all his productions for over twenty years and was also there at the time in London in 1974.